Japanese Episode DP 005: "Naetle! I Got One!" American Episode 469: "Gettin' Twiggy With It!" While on the way to Kotobuki City, Satoshi's Pikachu gets kidnapped by the Rocket-Dan! Satoshi sends out his Mukkuru to battle, but it ends up accidentally causing the balloon to crash! When they land, the Rocket-Dan are greeted by a wild Naetle who decides to protect Pikachu. After the turtle pokemon sends the trio blasting off, Satoshi and the others catch up to Pikachu. Naetle, thinking our heroes are its enemies, launches an attack at Satoshi that ends up with him being knocked out by Sleep Powder. When he wakes up, he finds himself in the house of an herbal botanist named Yukino. Yukino explains that the Naetle they had met is known for protecting the pokemon in the area and guesses that the reason it attacked Satoshi earlier was because it had seen the trainer as its enemy. Satoshi goes back into the forest and is able to convince Naetle that he's not its enemy. Satoshi-tachi return to Yukino's herb garden, where the Rocket-Dan appear in their Koiking sub and attempt to kidnap Pikachu and Naetle! 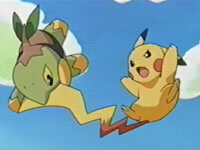 Satoshi chases after Musashi-tachi and is able to coach Pikachu into freeing itself. Once the battle is brought to land, Naetle joins in and proves to Satoshi how powerful a pokemon it is. The battle quickly ends, so Satoshi-tachi start to resume their journey...however, Yukino announces that Naetle wants to go with Satoshi! After a brief battle, Satoshi officially captures Naetle, making it his second Shinou region capture. With a new friend by his side, Satoshi returns on the trail to Kotobuki City. What do you get when you make that girl Midori (from "Fushigidane's Hidden Village") and age her about 30-40 years? You get "Naetle! I Got One!" The similarities can't be ignored (Yukino even lives right beside a lake! ), but despite that, this episode is still pretty decent. Naetle's one of those pokemon I didn't like before the anime - I thought it was ugly as sin based on the Sugimori art -, but the way it acts in this and future episodes is great. I really liked the part where it bows to Satoshi, and the head biting thing is funny even though that's one of those things that Kojirou's pokemon have been doing for years. PUSA must have a bag full of "stereotypical old woman" sayings somewhere because they were out in full force in this episode. I mean..."Mercy me!"? "Land sakes!"? "Heavens!"? Jeez. Also, I was watching and thinking how much better Sarah Natochenny's gotten. "Wow, she's really getting the character down-pat," I thought. Which is good since this is officially the last episode of Season 9 and all. But then, Ash laughs. It happens after he remembers being tackled by Naetle, and it is one of the worst attempts at a laugh I've ever heard in my life. Like, if I was talking to someone and did a laugh like that, the other person would think I'm just being a prick a punch me in the face. It's that bad-sounding. The next episode preview in the Japanese version of this episode is shorter than usual, and according to PokeAni, the reason is because they also wanted to promote the Japanese version of The Mastermind of Mirage Pokémon. I actually liked this shortened preview better...something about seeing the episode title with animation behind it rather than seeing it on top of a title card is somehow cooler to me. Don't know why. The background music is so bad in this episode that it gets its own little box. The scene that really bothers me in this episode is the one where Satoshi gets sprayed by Sleep Powder. The reason I'm upset is because in the Japanese version, the scene is played up for laughs. It has some really jovial music playing, and that along with the visuals lets us know that this isn't a scene to be taken seriously. So what does the dub do? Replace that happy music (which we've heard in the dub before) and replaces it with this ultra serious stuff. An Oddish stumbles and accidentally hits Ash with a Sleep Powder, PUSA. It isn't some dire situation that requires you to break out the same music you'd use for the big Palkia/Dialga showdown. Jeez. The TO BE CONTINUED screen is three seconds longer in the dub than it is in the Japanese version.